For Collecting Metallic Dust & Debris such as Aluminum, Magnesium, Titanium, Commercial Alloys. Collects Maximum of 22 lbs. (10 kg) of Dust. Legally certified as explosion-proof and dust ignition-proof. Utilized for the recovery of metallic, conductive and explosive dusts, into a liquid immersion bath such as water, paraffin oil or mineral oil. Renders hazardous dusts inert. Recovery capacity of 22 lbs (10 kg) of dust into 7.9 gallons (30 liters) of neutralizing liquid. Includes HEPA H14 Filter with 99.995% efficiency on 0.3 micron. Filter is located downstream of the motor. Stainless steel recovery tank (SAE 304). Easy “one click” detaching and connecting of tank! Unit is static-dissipating (kit included) and conductive. Aerosol leak tested for quality assurance. Equipped with easy-glide cart and tool basket. 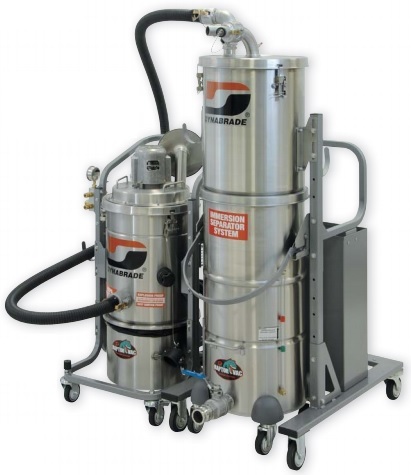 Dynabrade recommends the use of Mineral Oil with viscosity of 10.5 cSt. *NOTE: Be sure to add air consumption for EACH TOOL attached to Vacuum, for total CFM (L/Min) requirement.